Let’s break this down a little further. Start with Yzma. The first thing that stands out is the way she’s leaning to the right. This instantly breaks up the twinning that might otherwise occur in a shrugging pose. That’s not all the animator did, though. Further inspection notes that her head is tilted, her arms are dissimilar, and there are no “even” horizontal lines from one arm to the other (outside the elbows, which provide contrast). 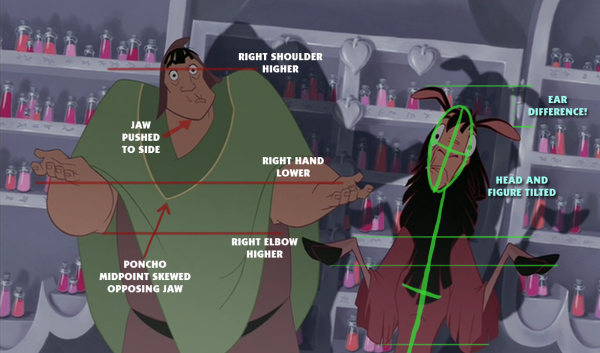 Compare this to Kronk and you see Yzma’s pose is much, much stronger. Whether this was done deliberately (as Yzma is a more powerful character, physical attributes aside) we don’t know, but it’s a perfect example of pushing a twinned pose to achieve a better result. 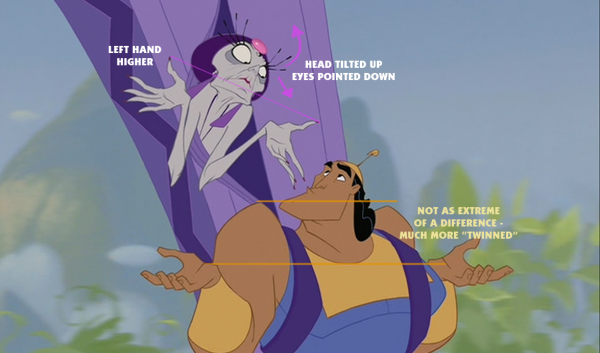 Kronk is still mostly non-twinned because of the 3/4 view he is shown in. 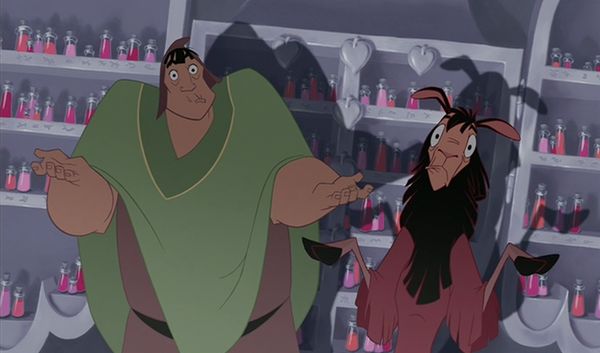 This shot directly follows Yzma looking to the two characters while Kronk is off in his own world. As such, a straight-on angle lends itself perfectly to the comedy of the scene and a 3/4 angle simply would not be as strong. So what’s an animator to do? Run with it! Kuzco, on the other hand, has a very standard pose but thanks to a simple angle rotation of the character it remains fresh and full of life. In this case a normal “shrug” animation could have been created and then rotated slightly to achieve this effect. Easy and effective! Any Other Ways to Avoid Twinning? Say you’ve got an extreme situation with a picky director that is absolutely ADAMANT that you use a straight-ahead shot and keep the limbs even on your keyframes. All is not lost! You just have to play with timing and inbetweens to inject some contrast and appeal back into an otherwise boring scene. First consider the boring standard shrug, filled to the brim with twinning. Now we’re getting somewhere! By delaying the right side just a bit and also moving the head around, we come away with something much more filled with soul than the simple shrug above. It’s not perfect and still needs a bit of tweaking, but the bones are there and we can keep pushing things to be even better for the final shot. And it wasn’t a tremendous amount more work, either! Hopefully our Director Pretend-o will be pleased. Think of any others? Post it in the comments below! As we’ve said before, Twinning isn’t always evil. Sometimes you’ll want the cliche aspect it provides (that’s why we have cliches!). Most of the time, though, a little bit of animation elbow-grease will remove it from your shots and make a much more appealing result on screen. Excellent article as always. Those are some useful tips. Even Richard Williams stated twinning isn’t all bad. It’s useful for representing authority. I like the helpful information you provide in your articles. I’ll bookmark your site and check more right here regularly. Best of luck for the next! This is really helpful to see thanks! i actually appreciate your content. when you have real examples it helps to understand. i read about twinning in books but it does not usually have examples so it gets confusing at times. I’d love to see more animated examples. Will there be a third in the twinning series? I usually do stuff from the side view so there is no chance of symmetrical. I also like the animated examples. I hope to see more. Great article on twinning. More animators especially in 3D need to remember this junk.